Anne Hillerman's gift for story-telling is nowhere as evident as in Ride the Wind: USA to Africa with its exhaustive research, transcriptions of radio transmissions between the flight operators, and photos of the balloons in full splendor. The transatlantic race between teams from Belgium, Germany, the Netherlands, the United Kingdom, and the United States became more of a cooperative venture as teams radioed information back and forth about locale, altitude, wind streams, and equipment malfunction. To ensure equality of competition, all the dual-design gas and helium powered balloons were exactly the same with a height of 90 feet and a weight of 100 pounds. A bright yellow, four by seven foot floating capsule would ensure an emergency landing at sea. Thousands observed the pre-dawn launch of the five balloons on September 16, 1992. Not only did the crews hope to win by being the fastest to fly over the Atlantic, they also hoped to break Richard's father's record of 137 hours in the air. Novice readers will learn all about the mechanics of ballooning, from zonal flows and rigging to ballasting and feathering the burner. Adventure seekers and travelers will embark on a hair-splitting journey as helium valves stick open and the over-inflated balloon threatens to rip apart. The balloonists endure a lack of privacy, hygeine, and climactic extremes, clearing ice from the equipment in the morn, and sweating from the balloon envelope's heat later in the day. This tale of a competitive, transatlantic balloon flight is a historic tale of cooperation and courage, eloquently conveyed by one of the Southwest's great storytellers. 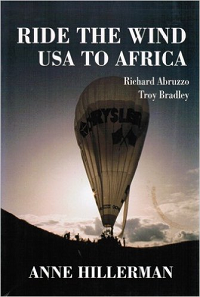 Although the Belgians won the race, the U.S. balloon piloted by Abruzzo and Bradley flew onto Morocco, making it into the record books for the longest time in flight at 145 hours.